The Coconut Grove Arts Festival and the St. Stephen's Art Show are February 18-20, 2017. We'll be profiling some of the artists who are participating this year. 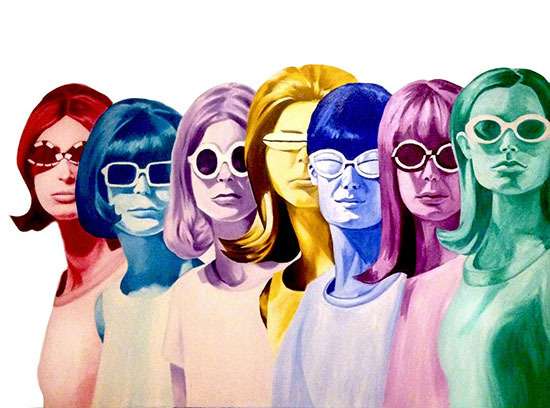 Today, Sofia del Rivero is featured, she will be showing at the Coconut Grove Arts Festival. This is Sofia del Rivero's first year showing her work in the Coconut Grove Arts Festival, she is participating as an emerging artist. Sofia's first art show was Superfine! this past December during Miami Art Week. She works in oils. "It was a great experience because although Superfine! is fairly new to the Miami art scene, it has quickly gained recognition for representing affordable, friendly, and non-pretentious art. I was able to meet amazing, talented people from all over the world," she says. Sofia is very inspired by ancient prophecies and how they come into play in modern times; in particular those that have to do with empowerment in women and the relationship with the environment. "There are many civilizations, such as the Mayans, that predicted a transfer of the staff of power from the masculine to the feminine. These prophecies were about ending a chunk of history and beginning a new era with the nurturing spirit of a feminine power overseeing us and guiding us to work with nature rather than against it. I love learning all about these different primeval yet advanced civilizations and what they had envisioned for us physically and spiritually. I have grown up surrounded by strong women my entire life, so that topic really resonates with me," Sofia said. This Miamian is influenced by a lot of different artists both contemporary and classical. She tells me that lately she's been intrigued by clean, graphic, illustrative styles, such as those of Mexican artists Ivan Salamanca and Curiot. 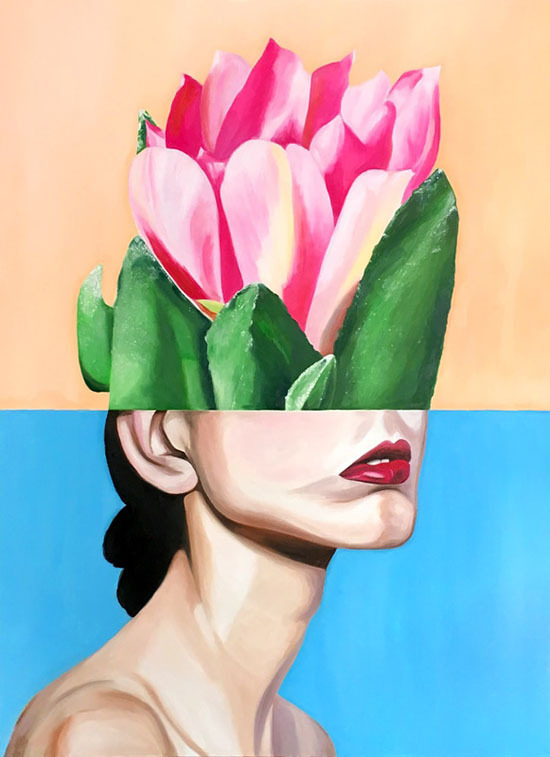 Sofia says, "I've also always been inspired by the surrealist styles of Frida Kahlo and Georgia O'Keeffe and the powerful use of symbolism and nature motifs within their paintings." Her colors are bright and clean, she believes that being from Miami that it has instilled in her a love for bright, vibrant colors. "It's just something I've always been exposed to. 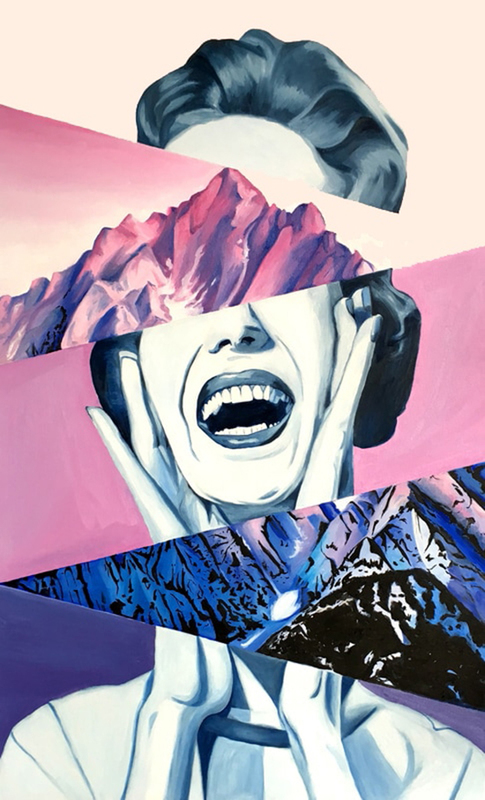 Even being outside surrounded by all the Art Deco architecture in Miami, full of aquas and pinks, it's something that subconsciously gets carried into my personal artwork," Sofia said. She loves working at night. She teaches art to kids all day long, so seeing the students working so hard on their own projects automatically inspires her to start or continue a project of her own. "I love ending class, going home, and painting for long periods of time, maybe even 8-9 hours at a time. My ideal setting for painting is in my bedroom at night, either listening to music, podcasts, or background noise like a bad detective TV show." This past January, Sofia participated in the Beaux Arts Festival in Coral Gables and was selected as the cover artist for their brochure. "It was an incredible honor, considering it was only my first time participating in that festival and my second time exhibiting overall. I also had the honor recently to be interviewed by NBC6 for a segment about my art and my experience running my own art school, Art Box, right here in Coconut Grove (airs Friday, February 17th at 7 pm). Look for Sofia this weekend at the Coconut Grove Arts Festival - Booth #651. So impressed by you Sofie, what a impressive resume and talented creative person you are.